On September 10, 1960 two of the most highly-regarded teams in the new American Football League made their regular season debut at the Los Angeles Memorial Coliseum. The Los Angeles Chargers were coached by Sid Gillman, the most experienced of the new circuit’s head coaches as he had previously led the NFL Rams and had one Western Conference title under his belt. 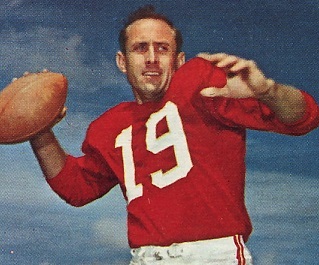 LA had signed a fair amount of good young talent, some with pro experience, including QB Jack Kemp (pictured above) who had brief stints in the NFL and CFL after coming out of Occidental. The visiting Dallas Texans were owned by AFL founder Lamar Hunt and coached by Hank Stram, a highly-regarded college assistant who had most recently been at Purdue. The team had a distinctively Lone Star State composition, starting with QB Cotton Davidson, formerly of Baylor, and including rookie FB Jack Spikes from TCU and quick-footed HB Abner Haynes of North Texas State. Dallas rolled impressively through the preseason without a loss. There were 17,724 in attendance for the Saturday night game. The Texans went three-and-out on their first possession and Los Angeles fumbled the ball away to end its first series. Taking over at the LA 42, Dallas advanced to the 20 but a 27-yard field goal attempt by Jack Spikes was no good. Following a punt by the Chargers, the Texans drove 60 yards in eight plays. They ran the ball effectively and Cotton Davidson completed three passes, including one for 16 yards to end Max Boydston and a 12-yard touchdown throw to end Chris Burford. Spikes missed the extra point try and the score remained 6-0 heading into the second quarter. Following another LA punt early in the period, Dallas, starting from its own six yard line, put together a long drive. The Texans converted four third downs as Davidson completed four passes and ran for three yards on a quarterback sneak. Spikes ran for a touchdown from a yard out and this time was successful in adding the PAT. The visitors were ahead by 13-0. The teams traded punts before the Chargers came through with a big play. Jack Kemp connected with end Ralph Anderson for a 46-yard TD and, with Ben Agajanian’s extra point, the Dallas lead was cut to six points. The Texans responded by going 80 yards in 12 plays. Davidson (pictured below) started off with a screen pass to Abner Haynes that gained 17 yards and followed up with a throw to Boydston to the LA 47. With time running out in the half, Davidson primarily kept the ball in the air. Spikes ran for three yards to convert a fourth-and-one at the LA 26 and three plays later Davidson passed to Haynes for a 17-yard touchdown. Spikes again converted the extra point and the score stood at 20-7 in favor of Dallas at the half. The Chargers went three-and-out to start the third quarter and again the Texans drove into scoring position. Reaching the LA 22, Dallas lined up to attempt a field goal but a bad snap sailed past holder Hunter Enis and gave Los Angeles the ball at the Dallas 49. However, the Chargers were unable to capitalize when their drive reached the 29 and Agajanian’s try for a field goal was blocked. Following a punt by the Texans, the Chargers advanced to the Dallas eight. But HB Paul Lowe was stopped for no gain, Kemp tossed two incomplete passes, and on fourth-and-goal Kemp was sacked to end the threat. The Dallas lead appeared to be safe heading into the fourth quarter. The Texans again punted and the Chargers took over at their 32. Kemp completed three straight passes to get the ball into Dallas territory. It seemed as though LA would again come up empty when Kemp threw an incomplete pass on a fourth-and-two play at the Dallas 43, but the Texans were called for pass interference and the series kept going. Lowe ran for seven yards and then tossed an option pass to Anderson for 24 yards to the eight yard line. Three plays later Kemp scrambled for a seven-yard touchdown and Agajanian’s extra point made the tally 20-14. The Texans went three-and-out on their next possession and punted once more but had the Chargers backed up to their ten yard line. LA used 15 plays to cover the 90 yards. Along the way, a Kemp fumble was erased by a penalty on the Texans and a third-and-15 situation was converted when Kemp connected with flanker Royce Womble for a 36-yard gain to the Dallas 41. Again a pass interference penalty on a fourth-down play kept the Chargers alive and Kemp finally tossed a four-yard scoring pass to FB Howie Ferguson. Agajanian’s critical extra point try was successful and Los Angeles was ahead by one with just over two minutes remaining on the clock. The Texans still had a chance but Davidson threw an interception to seal the 21-20 win for the Chargers. Los Angeles outgained the Texans (354 yards to 294) and had the edge in first downs (22 to 21). Each team turned the ball over once, although the Texans were penalized seven times to two flags thrown on the home team. Jack Kemp completed 24 of 41 passes for 275 yards and two touchdowns with none intercepted; he also ran the ball 7 times for 19 yards and a TD. Royce Womble caught 7 passes for 92 yards and Ralph Anderson gained 103 yards on 5 receptions that included a score. Unheralded HB Paul Lowe led the ground game with just 20 yards on 8 carries while Howie Ferguson was right behind with his 19 yards on 8 attempts. For the Texans, Cotton Davidson was successful on 22 of 40 throws for 230 yards and two TDs with one interception. Jack Spikes (pictured below) ran for 62 yards on 9 carries and scored a touchdown. Abner Haynes only rushed for 15 yards on three attempts but had 7 pass receptions for 62 yards and a score. The Chargers lost their next two games and were 2-3 before winning eight of their last nine and topping the Western Division at 10-4. They lost the AFL title game to the Houston Oilers. They also relocated to San Diego for the 1961 season, having failed to draw in Los Angeles despite having an exciting offensive team. 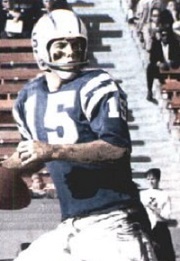 Jack Kemp led the AFL in passing and was an All-League selection, throwing for 3018 yards and 20 touchdowns. 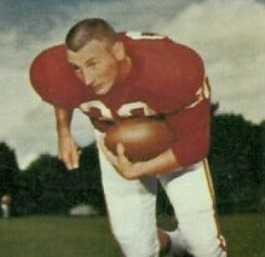 Paul Lowe would carry more of the load on offense as the season progressed and finished second in the league with 855 rushing yards. Dallas finished second in the division at 8-6. Abner Haynes ended up not only being Rookie of the Year but Player of the Year as well as he paced the AFL in rushing with 875 yards and in all-purpose yards with 2100.